There are two ways to share your unique postcard. 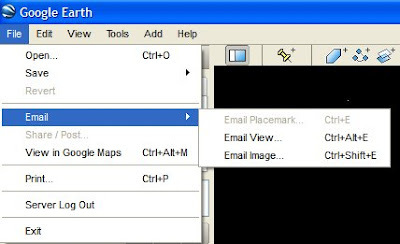 Head to the File menu and select "Email", or simply click on the envelope icon in the toolbar. To send a static image - just like a traditional postcard - select "Email image" (or "Graphic of 3D view" from the dialogue box if you clicked on the envelope). But maybe a simple image isn't enough and you want to send a more interactive postcard, the type of souvenir your friends will be able to fully explore and interact with. Sound like you? 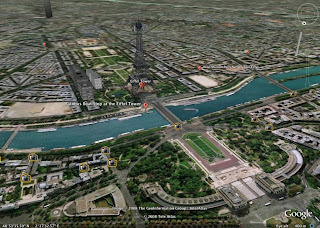 Try sending a .KMZ file of your view for your friends and family to see in Google Earth. To do this, click "Email View" in the menu, or "Snapshot of 3D View" from the dialogue box. This will send your friends or family a KMZ file which will fly them directly to the view in Google Earth, allowing them to explore the area for themselves. Once you choose which type of "postcard" you want to send, you'll be prompted to choose your email service; your JPEG or KMZ will then automatically be attached to the email. Now all that's left for you to do is write "Wish you were here! ".